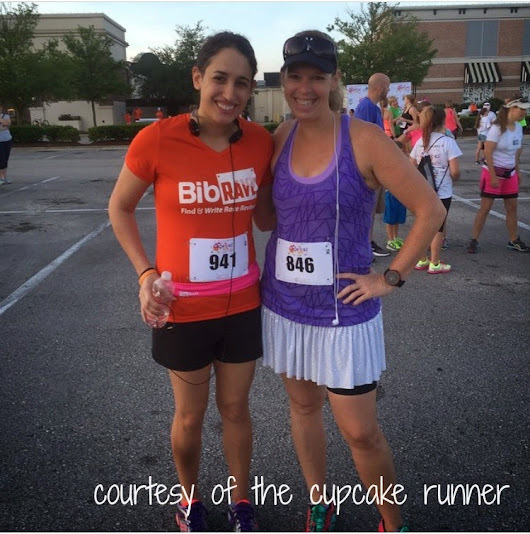 I wasn’t really sure if I was going to run the Cupcake Run benefitting Girls on the Run of Northeast Florida. 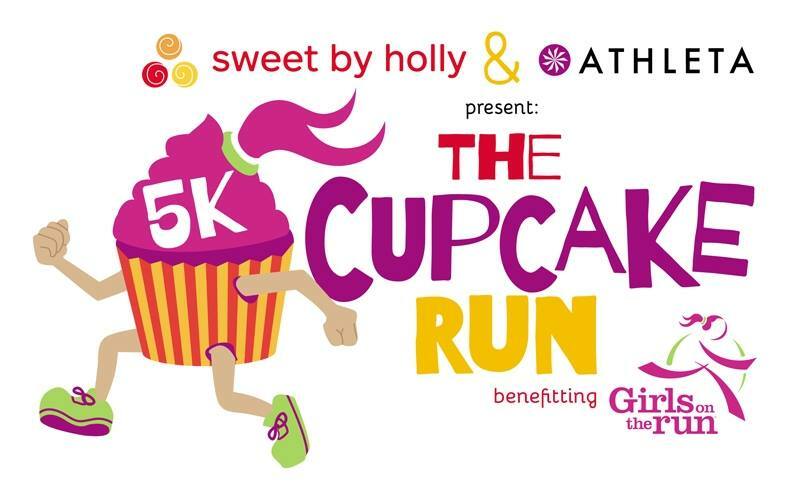 Needless to say, the lure of a cute medal and a finish line cupcake was quite tempting, and it’s always nice to be able to help out a great cause like Girls on the Run. I registered on the Monday before the race. 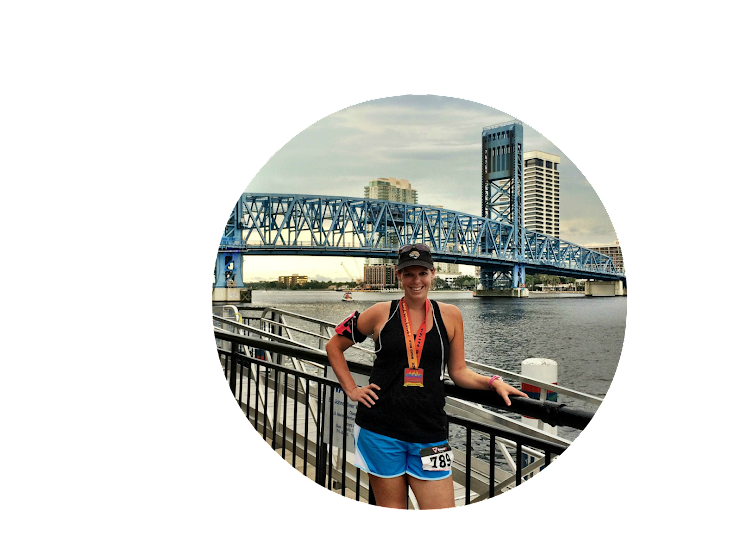 By Wednesday, I started receiving emails from the organizers of the event, stating that they were not prepared for the overwhelming interest, and that due to numbers, not all runners would receive a personalized bib or custom medal. As the week wore on, other emails advised that those who registration on race day were not guaranteed shirts or medals at all. 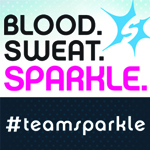 We were also encouraged to take advantage of advance packet pickup, because morning-of pickup would be difficult. Ever the rule follower, I headed to the Athleta store at St. Johns Town Center on Wednesday morning to pickup bibs for myself and some of my friends. 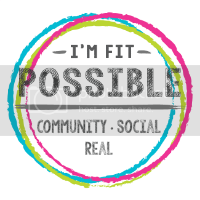 With only two volunteers on hand, and a very small area in which to work, it was a bit of a fiasco, but I finally walked away with shirts, bibs and swag bags. I got to the venue early on Saturday morning to ensure that I was able to score a decent parking spot. I headed over to the start line in front of the Pier 1. This race was going to be gun-timed, which didn’t thrill me. I was looking for a PR and a specific time, and I didn’t love the idea of shoving my way to the front line to do so. I settled on positioning myself maybe eight rows back, hugging the right hand side so I would be able to pull over to start my intervals. E joined me. We were just standing there, getting ready for our mark, when we realized that people were running. Just like that! So I tried to take off. Except a woman, who had been standing up on the median, chose that very moment to step down into the path of the runners. And stop. Directly in front of me. I pretty much plowed right into her. She wasn’t running, walking, racing or otherwise involved in the race, so I’m not really sure what she was doing, but I was pretty steamed, especially since it jacked up my right calf a little. Boo. So I did the only thing I could: resumed running. 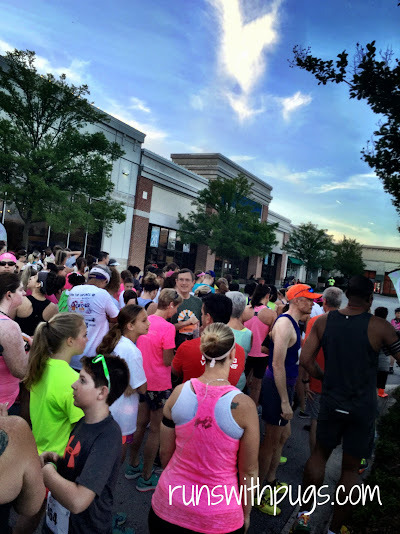 The course was a double loop around Town Center. It wasn’t the most scenic of routes, but it was pretty flat and mostly shaded, so I can’t complain. The weather was slightly less cooperative. Even with the early start time, it was so horribly humid. Ugh. I had absolutely zero intention of stopping for water at the halfway point, but I was having a little trouble with my body temperature, so I had to kiss that plan goodbye. I was staying pretty consistent with my :60/:15 intervals, although I was getting pretty tired going into the last half of the second loop. I wasn’t surprised by it, but I was incredibly hopeful I could make it to the finish line strong. As we were rounding a corner, I got a little lift. My friend’s daughter came zipping up past me. At the same time, the theme from Superman started playing on my iPod (yes, the 1977 version. Yes, I’m a nerd). The chase was on! I certainly couldn’t keep up with her, but that burst of adrenaline pushed me around the last few turns and over the finish line! In 30:25! An almost three minute PR! 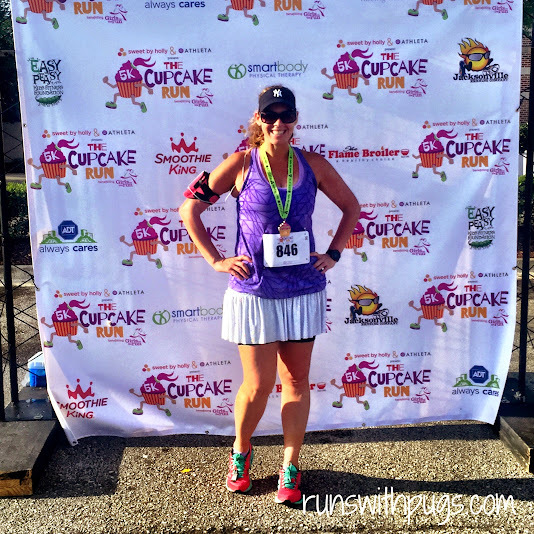 I cried my way through the finisher’s chute (bad idea, as I cried all the sweat into my eyes), collecting my medal, my cupcake and coupons for free yogurt and mini cupcakes from Sweet by Holly. After getting myself together, I positioned myself at the finish line to cheer in the rest of my friends. 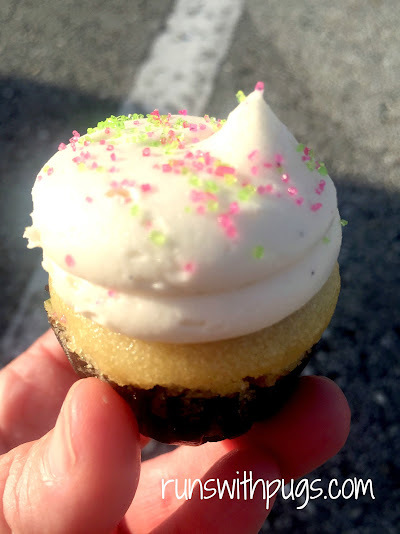 I hung out a bit to see E’s daughter participate in the one-mile fun run, and took the time to enjoy my cupcake. This race went so right. Even though it wasn’t the sub 30 I’ve been seeing on my training runs, I can account for 30-60 seconds because of the gun start and walking through the water stop. There’s not much I can do about gun vs chip, but I can carry my own handheld so I don’t have to stop (although I’m not going to lie, those extra walking seconds were heavenly). I’m amazed at what happened out on the course on Saturday. Granted, at the end of the day, it was my training and my work, but it seems like I tend to tank in race scenarios. Maybe my new intervals have given me a confidence boost to carry through my self-imposed pressure, or maybe it was just a good day. We shall have to see. 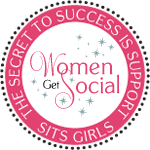 In the meantime, I’m riding the PR high and looking at ways to get even closer to my 2015 goal. 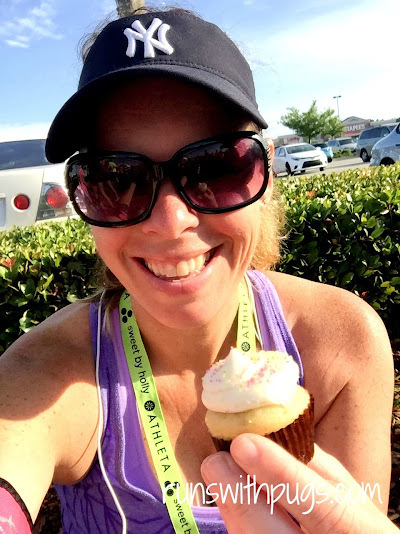 What’s your favorite post race treat? Do you prefer gun-timed or chip-timed races? Sounds like this race is new and can stand to gain a little in the organization department… It also seems like a great concept and hopefully they will have worked out the kinks for next year! I’m glad you were able to get the swag! Congrats on your PR! I mean between the gun time and the random pedestrian, that’s incredible! Your new intervals are definitely paying off! I’m definitely a post race banana eater. But once I’ve recovered some I love a good cookie or brownie. I think I’d love a cupcake too, they’ve just not been offered at any races I’ve been to. I much prefer chip time, I don’t think gun time is any sort of reflection at all in what you’ve done. At some races it’s a lot of time between when the race starts and when you finally cross the start line. At the NYC half for example, it took 45 minutes between the race start and my start. That would have been terrible if it reflected in my time! I know it’s an added expense to measure chip time, so for smaller races maybe it’s not that possible. But I think with the chips right on the bibs now it must be more cost effective than before. I’ve never organized a race though, so maybe I’m wrong on that. There is no way that they can do a gun time at the bigger events (can you imagine??? ), but it still stinks when it’s a medium sized race like this. Oh, well. It worked out this time, so I really can’t complain. Except for the random pedestrian. WHO DOES THAT???? Congrats! Great race. Yes, I hate races without chip timing. So you really did break 30 minutes. I love cupcakes and ice cream and anything sweet. So close! In my head, it doesn’t count unless it’s the recorded on the timing website. I just can’t be happy lol! Holy Moly, A three-minute PR is absolutely incredible! Especially in the 5K, it’s hard to make up any time I am in the 5K much less three minutes! 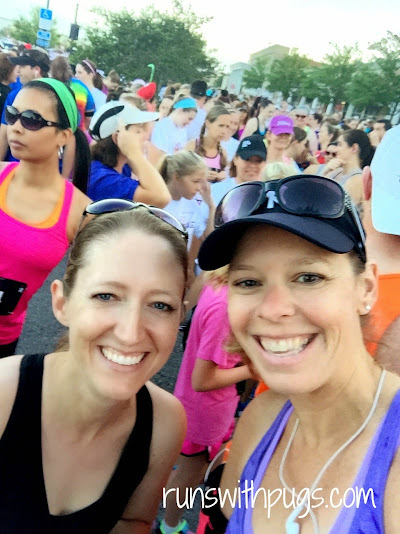 Anne recently posted…Rock n Roll Raleigh Race Recap – A New PR! I was pretty darn happy about it! Who would have thought I could really do it? 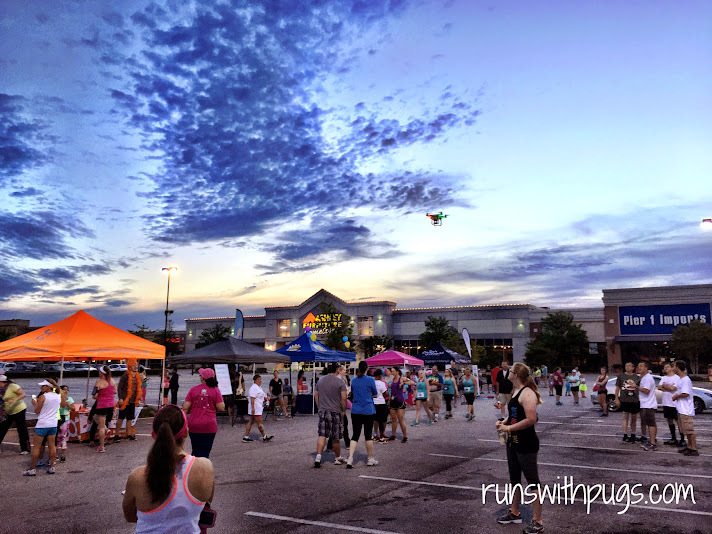 GOTR is a great organization and I hope they continue with little events like this. It turns out they raised over $24,000 so it would be silly not to. So many of the races I run here are big and of course, gun timed would kill my finish times. So I like chip timed races. And age grading is even nicer! A cupcake would be the ultimate finish. Wha! Why do people think they can walk across the street when a race is going on? Beyond me. Glad you still had an amazing race, though! Congrats on the PR. I don’t think I care about gun or chip timed, so long as it’s timed. Usually because gun timed events are so small the difference between the gun going off and me crossing the start line isn’t so incredibly huge. Right??? What are they thinking? Ugh! I guess you’re right. Timing is timing. I’m still super intimidated – I don’t feel like I belong right up front, but I guess that’s silly. As long as I stay out of the way to the right, apparently, I go off like a shot anyway so I wouldn’t be screwing anyone up. Congratulations! I really wanted to run this because I love cupcakes, but we decided to go to Disney on Ice instead of run. I hate gun time as official time. My 10K a few weeks ago was gun time. I didn’t start my watch until the start line so it is hard to know that I was about 30 seconds faster than my official time states. You would think 30 seconds doesn’t matter much, but oh it does! Woohoo. Congrats on the PR!! !